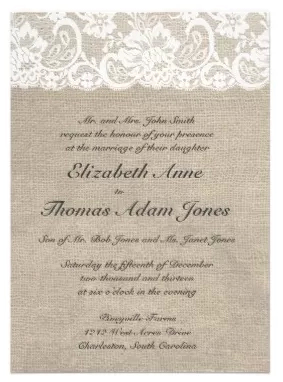 If you want substantial-looking wedding invitations, but are worried about the high cost of ordering traditional engraved invitations–or think your choices are severely limited–you needn’t fret. 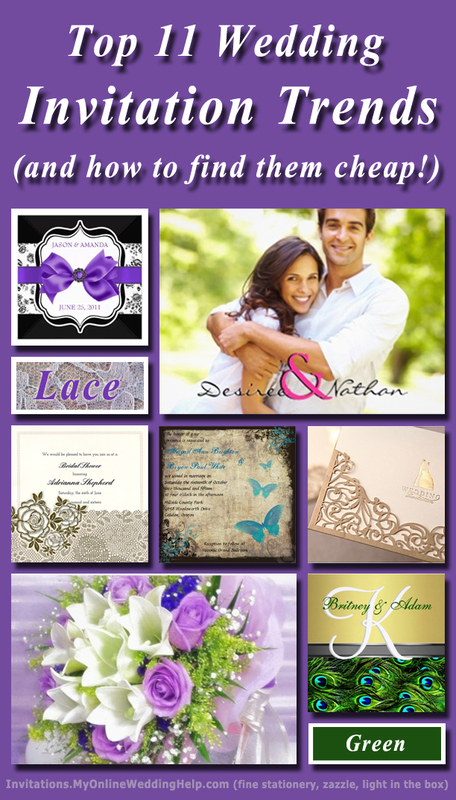 There are now online options to make very nice looking personalized invitations at a much lower cost. Your choices are numerous if you know where to look. 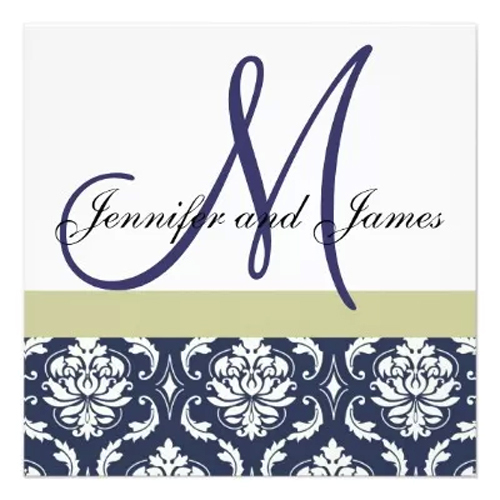 Here is a roundup of today’s top trends in invitations and my resources for finding inexpensive styles (most around $2 each or less…just click the bold headings and links to see a big selection of each from multiple online sellers). Many brides are looking for ways to personalize and assemble invitations themselves, whether it’s with their own designs or printing them at home. These days, DIY goes well beyond the blank, printable invitations you run through a personal printer. You can actually choose a design and fill in your wording online, place your order, and completed invitations will arrive at your doorstep. There is even a style called “separate and send,” which are all-in-one, perforated invitations with attached RSVP and reception cards. This saves you the cost of buying the latter two. As of this writing, they were running $1.29-$1.59 each in batches of 100. For some, the idea of a flat or single-fold card is too understated for a wedding. For this reason, multi-fold or pocket-type invitations–which clearly communicate the significance of a once-in-a-lifetime event–are still popular. They are also a more substantial way to protect and hold multiple pieces in the mailing. In the case of pocket invitations, you will usually (but not always) pay a $1-$2 more per invite. They are often sold as a set, but you can also buy the pockets separately to use with non-pocket designs. As technology progresses, so do delivery methods. Some are choosing to email their wedding invitations, either on their own or with the help of a service such as Glo. From an etiquette standpoint (although there are those who disagree) this is becoming more acceptable. The benefits are obvious–lower cost and no postage–but there are significant downfalls as well. Some people do not have email or do not check it regularly. There is also the danger of emails getting caught in spam filters, getting overlooked, or not arriving at all. So the potential for unintentionally hurt feelings is high. Because photographs are the ultimate in personalization, these are popular as well. You can find styles that include your photo as the entire cover as well as those that incorporate an image into the design. Blue is consistently voted the favorite color among women and, according to the most recent TheWeddingReport.com data, is the single most common wedding theme color. Purple is a modern favorite as well, coming in just behind blue in number of weddings with the theme. Blue and purple together are also a trendy choice. The Pantone color of the year is always a favorite when it comes to nearly anything wedding; for 2013 it is emerald. Combine this with the popularity of eco-friendly (i.e. nature-based) weddings and it’s understandable why the darker greens are popular this year. Certain kinds of patterns look elegant in almost any form, making them perennial favorites for weddings. is another. The current influx of vintage style and all-lace gowns boost its popularity even more. Vintage has gone from general “old lace and pill hats” to being literally broken out by era. Great Gatsby, Roaring ’20’s , the 50’s, etc. No matter what your take on vintage, you no doubt will find an invitation to reflect it!